Let’s face it. The world often seems crazy and out of control, affecting our sense of security and peacefulness, and sometimes numbing our creativity. But… what if I told you there is a well-known solution that most people haven’t tried – Mindfulness Meditation. Meditation broadens and deepens our calm mind, the part of ourselves that is quiet, conscious, and super creative. We experience this calm, creative state by letting go of the mental chatter that too often fills our heads. Mental chatter is usually about the past or future, not the present, and tends to focus on what our egos think we need to feel okay. Who hasn’t caught themselves chattering about what we should have said to a person who put us down — or how we could have avoided being hurt emotionally — or what to do about our angry overreactions to people and situations. Believe me, I took a long time to move past the chatter in my life. I couldn’t think clearly, I couldn’t concentrate on my writing. But meditation changed all that. Expanding our calm, creative mind is accomplished by sitting alone in a quiet place, observing our chatter, and then intentionally LETTING IT GO — and being persistent about it, for only twenty minutes. At first, when you attempt to let go of the chatter, you might find your quieter mind for a while, but then the chatter will rise up again urging you stop wasting time. Your ego will want you to go back to your usual coping methods. This is the cycle we all have to break. The real change happens when you don’t stop, and persist in letting the chatter go again, and again, and again. In place of the chatter, you will begin to notice intuitions, gut feelings, and an even greater centeredness that keeps you from overreacting. Now, your attention can be focused on the present moment. You find your inner guidance. Your thoughts become more intuitive and creative. You can see the real opportunities happening in your life. And our security comes from a deeper source which is not dependent on the actions of others. 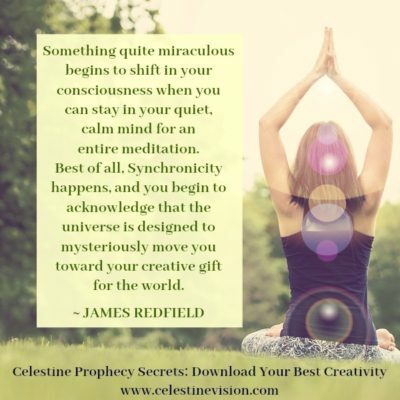 Best of all, Synchronicity happens, and you begin to acknowledge that the universe is designed to mysteriously move you toward your creative gift for the world. Stay in Karmic Alignment and your life takes off in a flow of heightened creativity and success.